Shopping in Whole Foods Market last week, I came across a vendor offering free samples of home-made Mu Mu Meusli. This product is made without added sugar, in upstate Sharon Springs, New York. There are 8 ingredients, and it tastes great. It’s made with oats, cranberries, wheat flakes, coconut, raisins, dates, flax, and almonds. Mu Mu Meusli is sold online, and in health food stores, including several in New York City. If you’re a meusli fan, and prefer avoiding added sugar in your breakfast cereal, check it out. Meusli cereal originated around 1900 in Switzerland, by a doctor who wanted to offer his patients a healthy diet. 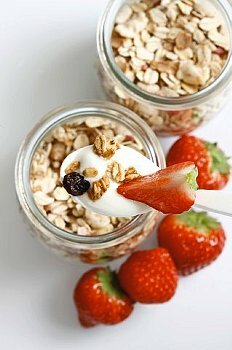 While there are variations, basic ingredients are rolled oats, dried fruits, nuts and seeds. Other varieties of meusli may contain wheat or rye flakes, honey, spices, such as cinnamon, or chocolate. Yogurt, fruit juice or fresh fruit, and nut milks may be added to meusli. Meusli provides a nutritious, quick breakfast, or a healthy snack. Posted on April 8, 2013, in Food, Recommended Products and tagged healthy eating, meusli, quick breakfast, raw foods. Bookmark the permalink. Leave a comment.